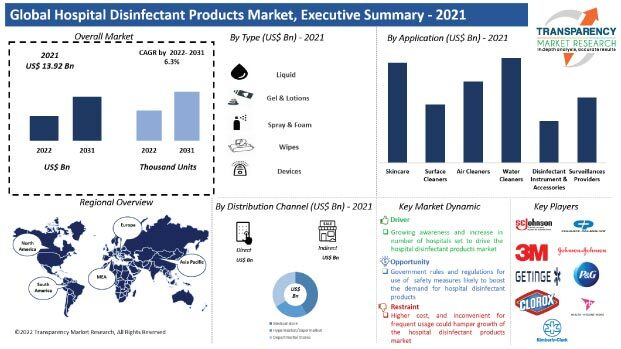 According to a new market report published by Transparency Market Research titled ‘Hospital Disinfectant Products Market - Global Industry Analysis, Size, Share, Growth, Trends, and Forecast, 2018 – 2026,’ the global hospital disinfectant products market was valued at US$ 10,845.74 Mn in 2017. It is expected to reach US$ 17,192.96 Mn in terms of revenue by 2026, expanding at a CAGR of 5.3% from 2018 to 2026. The market in Asia Pacific is likely to expand at a rapid growth rate during the forecast period from 2018 to 2026, due to increase in prevalence of infectious diseases in countries in Southeast Asia, presence of a large number of distribution channels, and launch of new hospital disinfectant products by major manufacturers. Factors such as increase in number of hospital-acquired/associated infections (HAI) across regions, increase in the number of minimally invasive surgeries, and rise in need for extensive use of medical instruments are expected to increase the demand for hospital disinfectant products during the forecast period. Apart from this, rise in stringent regulations in the medical sector regarding maintaining hygiene and cleanliness is expected to increase the adoption of hospital disinfectant products during the forecast period. In terms of type, the liquid segment is likely to offer significant expansion opportunities as liquid disinfectants are easy to reach surfaces or corners and are long lasting. In terms of skin care, the hand sanitizer segment is expected to maintain its market share due to increasing implementation of cleanliness and hygiene regulations mandated by state authorities, which is expected to boost the growth of the hospital disinfectant products market across the world during the forecast period 2018 – 2026. In terms of surface cleaner, floor cleaners and toilet cleaners are expected to be the most attractive segments as compared to other segments during the forecast period. The rise in number of chronic diseases and increase in surgical procedures are expected to boost the use of surface cleaners. In terms of air cleaner, the air neutralizer segment is expected to expand at a robust pace during the forecast period. Rising concerns related to asthma, respiratory disorders, and allergies due to degrading air quality, and government initiatives to control air pollution are likely to create considerable opportunities for the air neutralizer segment during the forecast period. The water cleaner products market is expected to expand at a rapid pace during the forecast period. Increase in awareness about water safety and quality, scarcity of potable water resources, and rising health concerns are expected to boost the water cleaner products market. In terms of disinfectant instrument & accessories, the air purifier segment captured majority share in the market due to rise in indoor air pollution. Water sterilizers hold the second largest share, followed by hand sanitizer dispenser and is expected to maintain their market share during the forecast period. In term of surveillance provider, antimicrobial stewardship holds the major share and is expected to maintain its share during the forecast period. In term of CAGR, infection prevention segment is expected to expand at the fastest rate during the forecast period. Based on region, Europe accounted for a dominant share of the hospital disinfectant products market in 2017. North America also accounted for a prominent share in the market. The market in North America is primarily driven by the rapidly increasing geriatric population and their admission to hospitals, high adoption of surgical treatment in clinics, and the rising incidence of infectious diseases among the population in the U.S.